Claudia Maluenda was born in Santiago de Chile and grew up in Lima, Paris, Madrid and Algiers. Since childhood she has trained in ballet and modern dance. In Berlin she graduated in Musical Theatre, having studied a large variety of dance styles, singing and acting. She is an active part of Berlin’s artistic scene having worked as a free-lancer in show ballet ensembles, galas, revue theatres as well as on cruise ships. She has also appeared on TV. Solo roles include Rosalia in “West Side Story” and numerous musical galas including “Cabaret”, “La Cage aux Folles”, “A Chorus Line” and “Cats”. 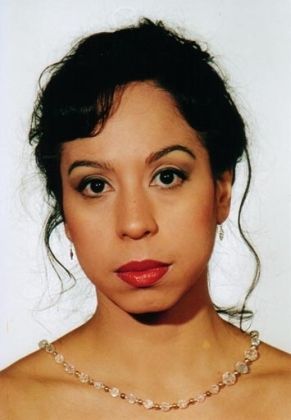 In 2002 Claudia Maluenda founded the company “LADORÉ – Revue Internationale de Danse & Chanson”. As leader and artistic director she quickly established the company as a diverse, extremely talented and highly professional ensemble, which already looks back at a substantial number of successes. Furthermore she developed the concepts for “Latinoamérica, mon amour…” and “Peces en el rio” in which she newly interprets Latin-American songs and French and German chansons that have been meaningful to her throughout her international upbringing. “Latinoamérica, mon amour…” and “Peces en el rio” unite these distinctive genres into a novel musical experience that arouses curiosity and emotions. Claudia Maluenda is also dedicated to the artistic training of children and teenagers and aims to increase access to dance by providing affordable prices for everyone. In the Ballet Studio Ladoré she provides comprehensive training in various styles.